Now, I’m not against minimalism, per se – culture is trending in that direction as the pendulum swings away from the “wacky patterns” era – but there’s a very strong case to be made that houses should be an exception to this. Science is starting to confirm a lot of what we know instinctively about living in aesthetically boring places: it’s not good for us. Walking down a block, much less a city, of white and gray rowhomes literally makes you unhealthy and unhappy. Why do so many people lean heavily conservative when it comes to painting their houses? Probably for the same reason so many people dress conservatively; they’re playing to not lose rather than playing to win. There’s a financial aspect to it, too. 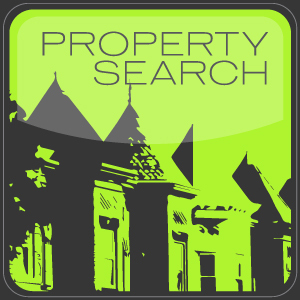 A house is the largest investment most of us will ever own (or in my case, never own), and the thought of doing anything to dent its value – picking an alienating color scheme, for instance – is understandably chilling. And yet just like dressing aesthetically safe misunderstands the cultural market (maximizing your appeal means taking risks), so does painting your house white to protect its value misunderstand the literal market (in an overheated market with plenty of buyers, broadening your house’s appeal isn’t necessary and may even be harmful). Which means you just spent six years living in the equivalent of a Marriott corporate quarters suite for no reason. 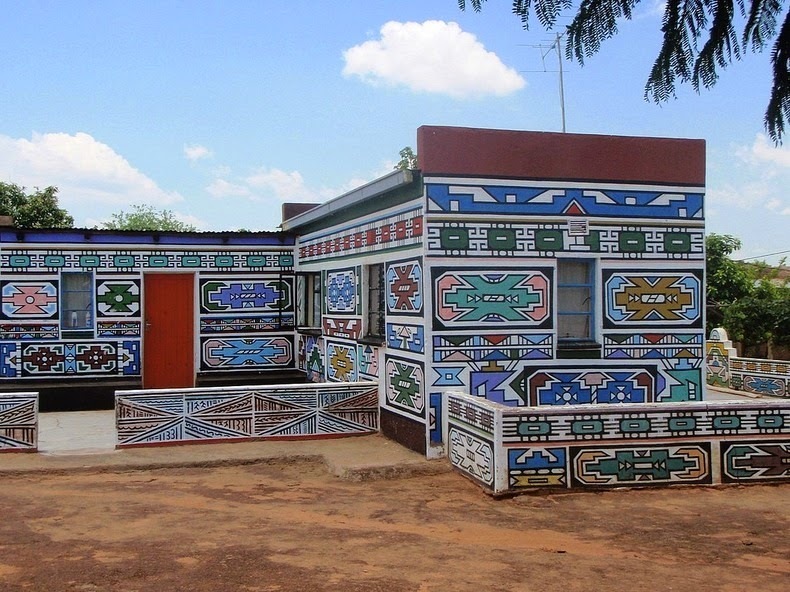 The Ndebele people of Zimbabwe and South Africa are well known for painting their houses in mosaics and patterns of spectacular color. 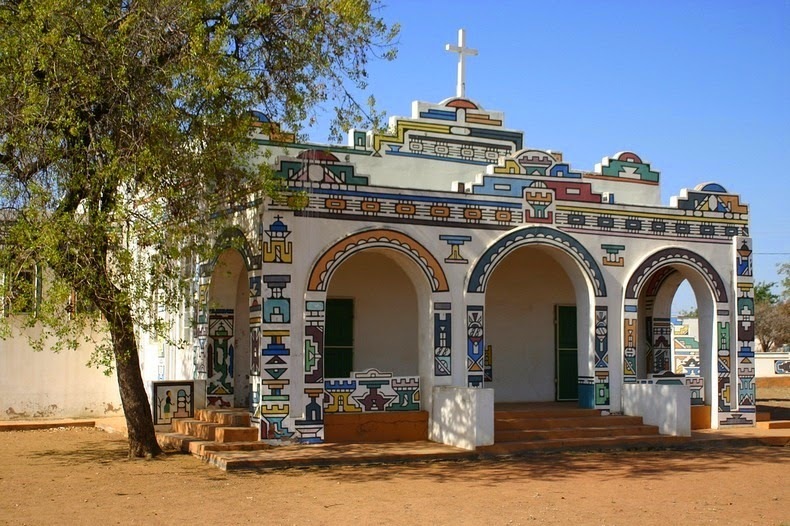 The tradition began as a way to communicate among themselves without the Boer colonizers knowing; each pattern and color has a specific meaning. 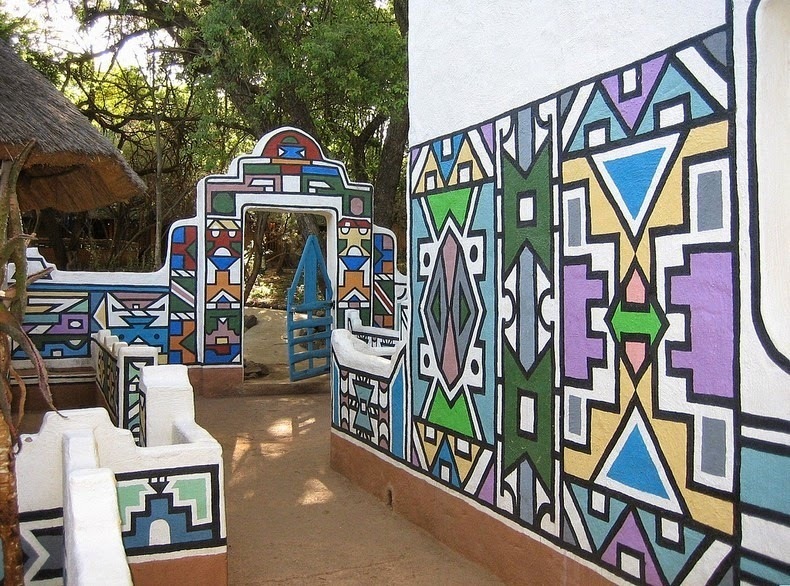 Until the 1940’s, the Ndebele painted their houses with natural pigments of earth tones, and repainted every year after the rainy season washed their walls clean. But once the French introduced acrylic paints to the area, the mosaics became not only permanent but spectacularly colorful. Obviously, you wouldn’t want to try and transfer this visual language to, say, a rowhome in Northwest, but you have to admit the idea of a colorful, geometric pattern for a house is intriguing. Plus, it’s a project. Since we’re all adults here, we can acknowledge that life is just one long, never-ending search for distractions from the looming void of death. 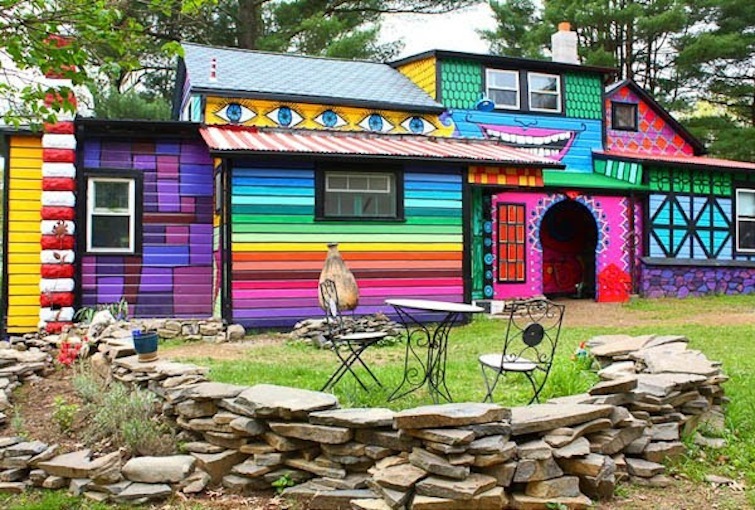 Painting your house like this would get you at least six, maybe as long as nine, months of blissful distraction. 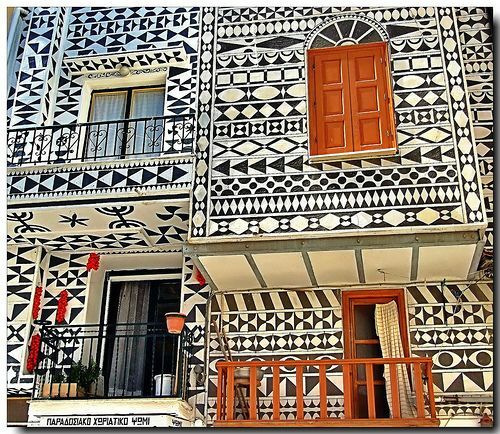 If color isn’t your thing, the “xysta houses” of the Greek island of Chios might be right up your alley. 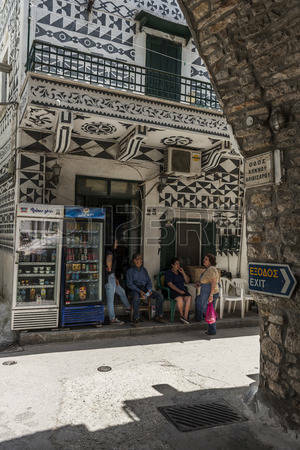 The houses in this ancient village (most of the structures date back to medieval times) are covered in an intricate black-and-white filigree called “xysta.” Remember when you smoked way too much weed that one time in high school and just sat in your room all day drawing kaleidoscopic patterns in your notebook? Now imagine someone doing that to an entire town. 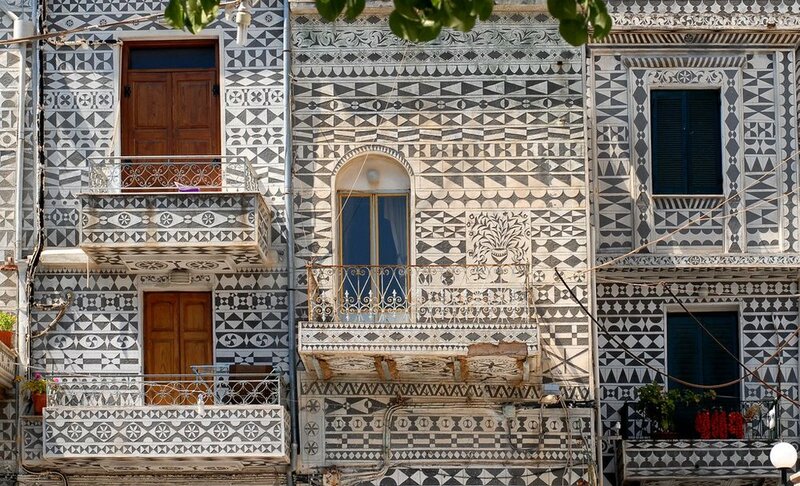 The weirdest part is that no one knows why the Greeks started drawing these patterns on their houses. A researcher in the area says it’s been going on since at least the 1700’s, and perhaps much longer; locals disagree on whether it came from Turkey or Italy. When asked why they draw on their houses, their answer is, “because we’ve always done it.” I definitely think it was started by some local who got way too high one day. 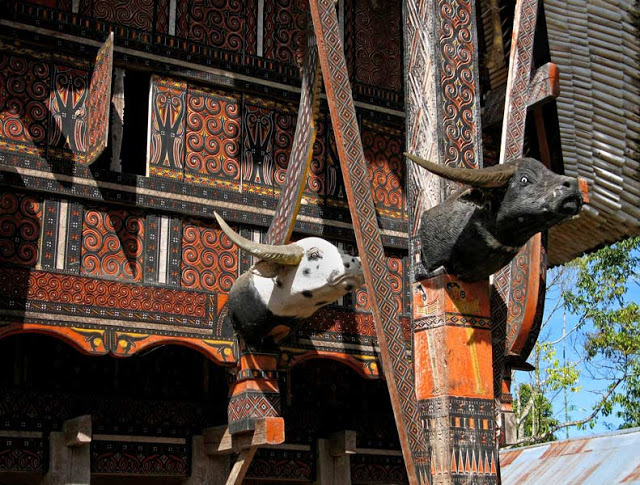 In the uplands of Sulawesi, Indonesia, the Toraja people are known for their ornately decorated bamboo houses. 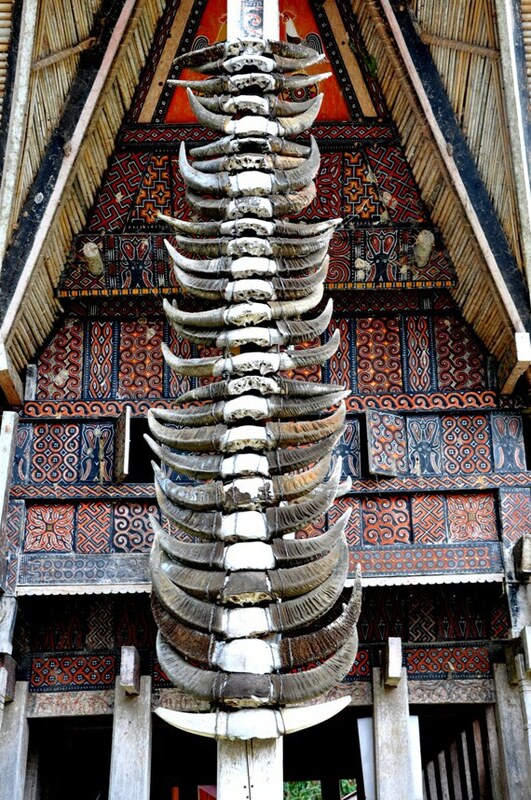 Traditionally, the Toraja have painted complex patterns and pictograms on wood panels, which they then attach to the outside of their houses; different symbols may represent the vocation of the house’s occupants, or could be a more general appeal to the gods for luck and fertility. 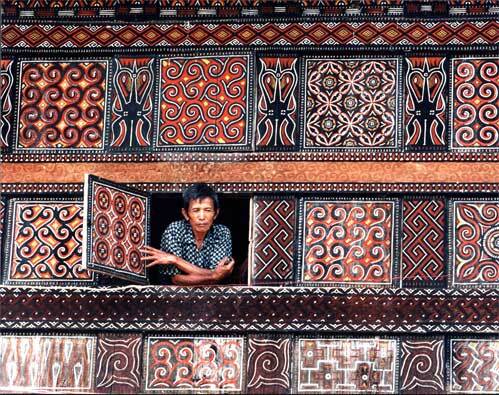 Local artisans use pigments made from soot, earth, and lime, which they mix with palm wine to form a usable paint. The results are stunning – and mathematically consistent, a fact that has stumped researchers for years, since it’s not supposed to be possible to produce symmetry on this order without advanced tools. It also goes without saying, I think, that if you have a lifelike, frowning wooden cow’s head affixed to the front of your house, you win everything forever.